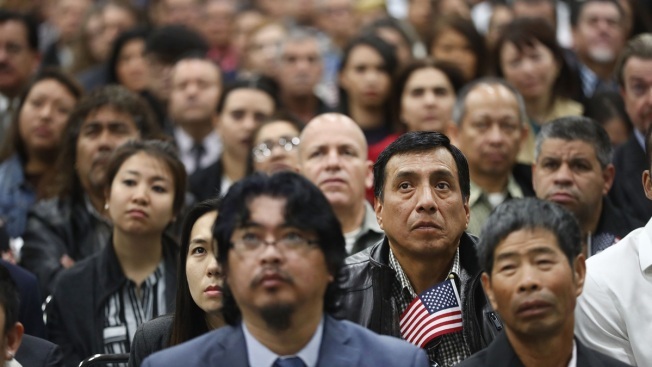 In this March 20, 2018, file photo, new U.S. citizens gather at a naturalization ceremony in Los Angeles, California. The naturalization ceremony welcomed more than 7,200 immigrants from over 100 countries who took the citizenship oath and pledged allegiance to the American flag. During FY 2016, the United States welcomed 752,800 new citizens to the country. Immigrants who are legally in the country and have applied to become U.S. citizens are having to wait as much as 20 months for their applications to be processed. Since President Donald Trump was elected, the backlog of pending applications has "skyrocketed," according to NBC News. There were nearly 730,000 pending naturalization applications as of the end of last year, a more than 87 percent increase since 2015 under President Barack Obama, according to the report from the National Partnership for New Americans, an alliance of immigrants' rights groups. Last year over 925,000 people applied for U.S. citizenship, according to the report. Under Obama, the backlog was 388,832 as of Dec. 31, 2015. The backlog leaves close to a million potential citizens without the right to vote and also leaves some vulnerable to deportation under Trump's policies.